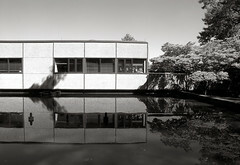 Thank you to everyone who attended the opening of my exhibit of architectural photography at the Ethical Society. You are invited to visit it while it remains on display through August. If you're able to see it, please let me know what you think. I'm most interested to hear people's reactions. 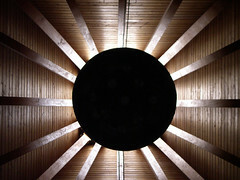 View looking directly upward toward the ceiling in the main space of the Ethical Society. The dark circle in the center in the suspended light. The radiating lines are the structural glulam roof supports that join at the peak of the roof where a skylight admits daylight. Photograph Andrew Raimist, November 2005. A working model for Armstrong's Ethical Society. The design as built generally corresponds to the model, but with some slight differences. The canopy at left, beyond the two glazed vestibules, was never constructed. 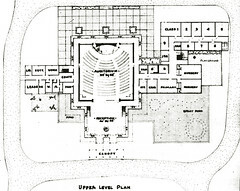 The rounding of the educational wing at the top and bottom of the end walls is not present as built. The configuration of the reflecting pool isn't quite the same as built. The trellis elements aren't show around the main copper roof (they may have been omitted intentionally). Additionally, the overhangs around the main entry hall appear to be solid planes rather than a trellis. In the built version, the trellis wraps around the front (south) side and the rear (north) side, but stops where it intersects with the roof of each wing. There seems to be an additional pair of columns at the main entry hall projecting the volume farther toward the south; this additional pair was eliminated in the constructed version. 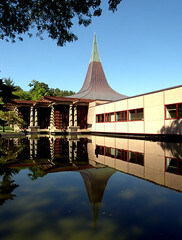 The separation between the main copper roof with its cantilevered brackets clearly wraps around the east, west, and south side continuously. In the way the roof was constructed, the juncture between the roof of the wings at each side isn't nearly as clear and distinct as indicated in the model. The low fenced in area at the east end of the education wing was set aside as a children's play area. The design of the fence depicted here was not constructed. 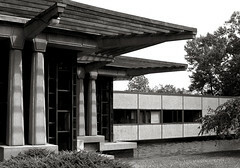 Rather, the wall system used continues the material and geometry of the rectangular education wing itself. 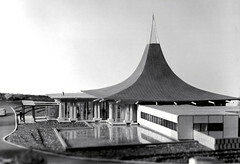 Model by Armstrong's office, circa 1961 (location unknown). 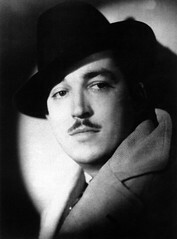 Photograph of model courtesy of the Harris Armstrong Archives, Special Collections, Washington University in Saint Louis. 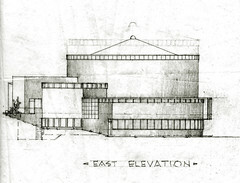 A very early sketch of Armstrong's for the East Facade of the Ethical Society. This drawing is circa 1961. South facade at education wing. View of the Southeast exterior of looking from the main entry toward the East. 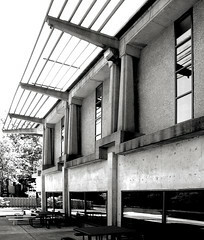 The difference in the character of the main pavilion (skeletal structure, fully glazed walls, and overhanging trellises supported on cantilevered brackets) versus the wings to the East and the West (non-structural surfaces, horizontal strip glazing, and no three-dimensional articulation of the facade) couldn't be more pronounced. Reflection of the South facade of the East educational wing. The wings to the East and the West have flat roofs. The reflecting pool tends to give it a floating feeling. The effect of the pools is quite different when the fountain jets are turned on. 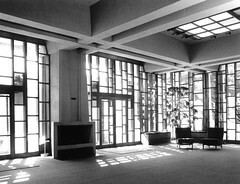 A view of the entry hall from about 1962. Architecturally, virtually nothing has changed. The film used when this was taken and the subsequent fading of the color print is likely the reason for the variation in color. Its seems much more muted and subdued compared to recent photographs. I'm assuming the glass panes are still the original ones. 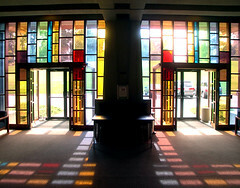 A more recent photograph of the main entry hall looking toward the east. 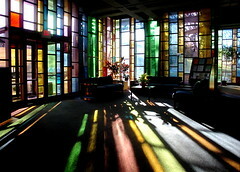 The effect of the colored glass is powerful and almost overwhelming. Certainly when comparing color photographs to black and white, the colored light tends to almost obscure the physical architecture, making spatial relationships more ambiguous, reducing the perception of structure & materiality, and abstracting the concept of windows and stained glass. Rather than the more typical experience of looking at a stained glass window, the experience is more like being contained within a stained glass space. The close proximity of the massive concrete fireplace positioned between the two entry vestibule creates a sense of fundamental elements being employed in a modern way. The use of fire and water are clearly used for symbolic as well as emotive expression. The density, solidity, and relatively high quality of finish relate the concrete structural elements to the stone masonry construction developed over millenia. Concrete was often referred to as being the modern adaptation of the heavy massive walls and structure of monumental buildings of the past. Rather than brutalist in its expression (as many concrete structural expressions by other architects of the time), it has a refined quality, giving the impression of almost having been solid stone carved into the forms presented. The fireplace has an almost surreal character. The two joined heavy pillars which constitute its flue are unique in the building. Yet the concrete box to contain the fire (and wood below) hardly seem capable of carrying the kind of weght involved. With a fire burning, this ellision of an emphemeral flame and a permanent, massive central column creates an intense flickering of matter along a vertical axis. The presence of a fire (and the upward movement of the resulting smoke) combined with the the massiveness of the structure (and the gradually widening columns) provides an intensely ambivalent image. In joining the sense of impermance and chaotic form (from the fire) with the massive, symmetrical, formal supporting structure, Armstrong focuses a great deal of attention on this central column. By dividing the facade in this way and creating two entries of relatively humble scale and construction, the building suggests that the nature of structure is intended to relate directly to the human (and often imperfect) condition. In blocking the central axis in this manner, feelings of grandeur and transcendence seem to be severely reduced, if not eliminated altogether. This condition (creating a solid rather than a void at the center) deters any tendency for hierarchical, ceremonial displays. Historically, churches, cathedrals, temples, and other religious structures will often keep the central axis open and focus a great deal of attention on it formally, architecturally, and symbolically. Sometimes such an axis presents itself as a kind of sacred path from the imperfect outside world to the protected transcendence of the sanctuary within. These kinds of central axes can also facilitate displays of power, authority, and judgment upon those unable to follow such an honored route. Armstrong's design seems to intentionally contradict that kind of hierarchical, monotheistic symbolism. Rather, the expression appears to focus attention on an individual's personal experiences and values as opposed to a pre-defined structure given by higher authorities. The design seems to emphasize the physicality of the human form, requiring the passage over a sort of bridge (over a symbolic moat) and entry through a blaze of light and color (in the shimmering glass facade). The visitor is given a choice to enter on one side of the central axis or the other without judgment; no one can choose to occupy the central path. These concepts seem to relate in an appropriate way to the ideals of the Ethical Society itself. The relationship between the design of the building, its control of circulation, admission of light, and expression of structure (among other features) can be evaluated for the degree to which they seem to support the philosophy of the organization. 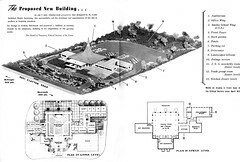 I want to explore this idea in greater detail for this building and others designed by Armstrong that seem to merit such an interpretation and approach. 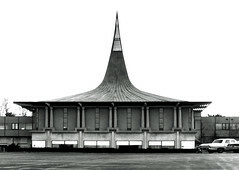 In particular, I will be examining, comparing, and contrasting his designs for religious structures (built and unbuilt). 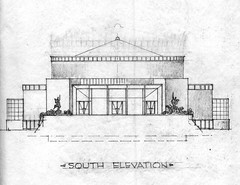 Where appropriate, this analytic method will also be applied to civic structures and other buildings consciously expressive of shared cultural values, such as his entry to the Jefferson National Expansion Memorial Competition (which resulted in the construction of Saarinen's Gateway Arch), his American Embassy in Iraq, and other projects that seem to suggest symbolic meanings greater than that of an individual. 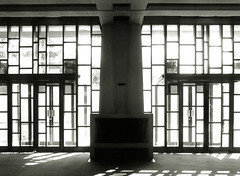 The issue of monumentality in modern architecture was a subject of great debate at the time following the conclusion of World War II. I would like to investigate Armstrong's explicit and implicit ideas in this regard. 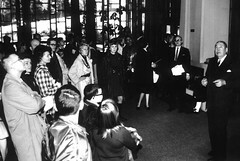 Harris Armstrong giving a tour of the Ethical Society in the mid 1960s. Armstrong is at the far right gazing upward. In his later years particularly, Armstrong served as a mentor and guide to students and the public in general with the goal of improving the understanding and appreciation of architecture. 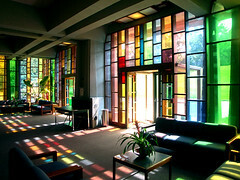 View looking toward the southeast corner of the reception hall. 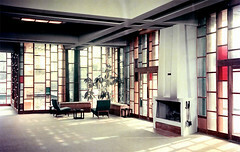 The paired concrete columns are kept on the exterior of the colored glass walls, except at the fireplace/chimney located between the two entry vestibules. Heavy paired concrete beams form a tartan grid at the ceiling. 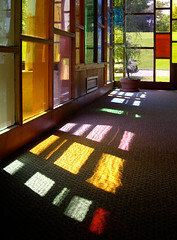 Vertical strips of colored glass make this south-facing space a wonderful visual experience on any sunny day.